Mildew and mold both are both tiny organisms — neither animal or plant. They are members of fungal hyphae, the fungi kingdom which includes mushrooms, yeast, and other “decay organisms.” Both thrive in moist, warm areas like food in the pantry, your shower floor, or behind damp wallpaper. Mildew is a surface fungus that can easily be identified as a patch of gray or even white fungus on the surface of a moist area. Mildew is easily treated with a store bought cleaner and a scrubbing brush. Mold, on the other hand, can be trickier to identify and is often the result of a much larger problem. Many types of mold exist in nature and can take hold in your damp home. Aspergillus is a fairly allergenic mold that is commonly found on foods and in home air conditioning systems. Cladosporium is typically a black or green “pepper-like” substance that grows on the back of toilets, painted surfaces, and fiberglass air ducts. Stachybotrys Atra (also known as black mold) is a greenish-black fungus that can grow on damp materials with a high cellulose content such as drywall sheetrock, dropped ceiling tiles, and wood. Despite the ominous reputation, its’ spores do not become easily airborne; contamination of indoor air is unusual. White molds which can include some dangerous characters including Histoplasma Capsulatum primarily found east of the Rockies and especially in the Missouri, Ohio, and Mississippi River valleys and Cocciodies Immitis in the western USA. Molds exist in practically every color, from purest white, brown, tan, green, red, orange, yellow, black and even blue. But, biologically, a mold is a mold is a mold. The color of the growth can help a scientist determine which species a particular mold might be, but color alone doesn’t tell you anything about a mold growth other than what color the growth happens to be at a specific point in time. Molds are more highly structured and complex in their construction and life cycle than any bacteria or virus. Instead of “cleaning” mold, you need to kill the entire organism, root and all, to help ensure a long-term solution to your mold problems. 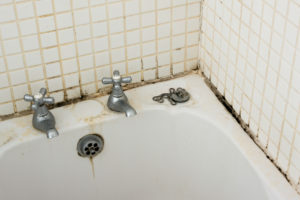 Mold remediation chemically disrupts the physical structure of the rooting and fruiting bodies of the mold organism itself. Musty odors can be caused by a number of things in your home, but, are usually an indication of mold and mildew. Molds and mildew cause that familiar “old” smell because they release a gas that gets into fabric, carpet, curtains, and furniture. Professional mold treatments will address this side effect. Since mold spores are so prevalent, testing isn’t difficult. Two basic methods are 1) surface swabs and 2) airborne testing. Both are needed; surface tests might miss some contamination. ERX will evaluate your home and then recommend appropriate and precise tests. With this data, they will identify the specific molds, tell you the expected and safe levels of each, and create a plan to eliminate. Call ERX Emergency Restoration Experts as soon as you can after water damage has occurred. The team will get to work with the latest technology to decrease drying time, reduce damage and get your life back to normal.